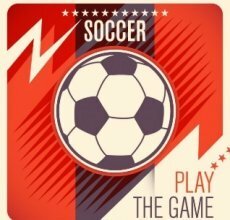 This play soccer quiz at gamerisms will test your understanding of several common phrases overheard by soccer players and fans from high school soccer games to internationally televised games. Later, you can impress your soccer-playing friends with your soccer IQ. Let's kick-off! 1) What is a Flick Header in the game of Soccer? C. Term for a player who deflects the ball with his/her head. 2) What does the term Instep Drive refer to? A. Refers to a precise and strong shot made from the instep of a soccer player's foot. 4) What is Shielding in the game of soccer? C. When the ball carrier is keeping and controlling the ball closely to ward off a defender. A. Term for the best of the best scoring player on the team. 7) What does the term Toe Poke mean? A. A tactic used by a player using a toe-touch to tackle a challenger. 9) What is a Sweeper according to soccer players? A. Last sub on the bench who is only used to 'clean up' after the starters have put the game out of reach. B. The remaining defender before reaching the goalie—a last line of defense. 10) What does the soccer term Golden Goal mean? A. The last goal scored in the finals of an international tournament, i.e. the Olympics. B. An amazing goal shot past more than 4 defenders plus the keeper. C. Goal that wins and completes the soccer game. Play Soccer Quiz Answers. Did you score a GOAL! 1) C. Flick Header: term for a player who deflects the ball with his/her head. 2) A. Instep Drive: refers to a precise and strong shot made from the instep of a soccer player's foot. 3) B. Outlet Passes: this action that begins a counter attack, occurs when the ball is moved towards the opposing team's goal. 4) C. Shielding: this ball carrier is keeping and controlling the ball closely to ward off a defender. 5) B. Small-sided Game: if you want to play a soccer game with less than 11 players/side, then this is the game for your group. 6) A. Striker: term for the best of the best scoring player on the team. 7) A Toe Poke: soccer game terms for tactic used by a player using a toe-touch to tackle a challenger. 8) C. Two-touch Play: term for a 2-step action where a player first gets the moving ball and follows with a shot or pass to another player. 9) B. Sweeper: the remaining defender before reaching the goalie—a last line of defense. 10) C. Golden Goal: goal that wins and completes the soccer game.